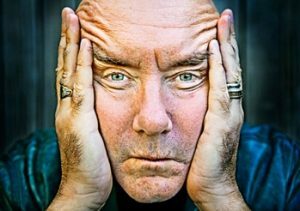 Irvine Welsh has been involved in dance music for most of his life. As a DJ & promoter and of course the films of his novels (Trainspotting/Ecstacy etc) are peppered with iconic tunes and references to the drug fuelled, loved up glory of the 90’s rave scene. Who better then to take on co-writing a TV drama series charting the rise of electronic music since the late 80’s – his latest project. He is currently touring the world (literally) in order to promote his new novel “Dead Men’s Trousers” whilst simultaneously promoting his last novel “Blade Artist” in countries such as France who have only just published the translation. The Miami resident Scot’s schedule is hectic beyond belief, yet he still wants to find the time to enjoy his passion for DJing on his travels. His most recent gigs were with legendary producer Arthur Baker & Paranoid London’s Quinn Whalley at Return to New York/The Ace Hotel, London and for DJ Magazine at Miami’s Winter Music Conference; which is no bad start for a relaunch of his music career. His penchant is for house, disco and for getting the dancefloor jumpin’ so where better to host him than on our eclectic roster of dance music legends and literary heroes.